Even since EFT was introduced (in India) by oDesk, I’ve using it for all my withdrawals. As a person who has used all other methods of withdrawals, I always find this convenient so far. May be, it just suits me. 🙂 Great post for anyone who is searching for in-depth information about EFT. Thanks Pothi for the comment! As the writer for TFP and a fellow oDesk freelancer, I felt that it was important to give others more insight on how LFT works and what they can do to make the entire process easy. What is remittance fee ?? I am from india and want to withdraw using LFT. So only $1.99 + conversion charges only applied to me ? I want to withdraw it to my local bankwill they charge me anything ? Ask your local bank about how much remittance fee they will charge you. It depends on the bank. This blog is about the experience of him from Philippines. Oh, about the bank slip, I’m actually still looking for a good free image software to use on the Mac that has the blur feature, so till then so long as my bank account number and location is kept secret, I’m not that worried. Doesn’t iPhoto have the blur feature? Great post by the way. Thanks for the info. I just started getting my contractor profile up at oDesk. Wish me luck! Re iPhoto, not sure really. I haven’t gotten around to learning the application yet. Thanks Stef! It appears that BPI is the right bank for LFT which is very nice though mine is Metrobank and i don’t know how much they charge. :( Also, I heard Unionbank and Landbank charges 50 pesos for it. Hi Nath! Well if you ever do decide to withdraw your earnings to Metrobank, let us know if they deducted any remittance fee so that readers who use Metrobank accounts to withdraw will be informed about it already. 🙂 And yes, Unionbank does charge P50 but for Landbank, someone in the forums mentioned them deducting P100. Hi! I would like to ask if you use the BPI Express (blue) card? Or can I use the BPI Express Cash Card too? BPI express cash is accepted in the LFT. though it takes at 3 days before you can get it. Again, thank you, I appreciate your immediate response. I have already inquire you before about using my sister’s BPI account but I have my EON account now and I’m satisfied with it. I’m an oDesk newbie and I don’t earn much as of now. I would usually withdraw my money on Wednesday and expect it to have arrived before Saturday; but if I use LFT, I would probably received it on the other week, isn’t it? I’ve also tried it the second time around and I received my money on the third day. It seems they’re really doing a great job with this. The only thing I hope they’ll change now is the exchange rate system. It’s very pointless that they display the current rate, and then use the next day’s rate. Other than that, it’s going pretty good now. Hi bloodytom! Good to hear from you again. 🙂 I actually wondered why oDesk chooses to use next day’s rate. Maybe their direct transfer system isn’t designed to apply the exchange rate of the day the withdrawal was made yet. Hopefully, they’ll update their direct transfer system to make it even more convenient for us Pinoy freelancers. Do you happen to have any idea RE: how long it takes for oDesk-to-UnionbankEON LFTs to clear? I went through some of the pages of the community forums and many claim that if you withdraw your earnings on Wednesday, you’ll get it in 3 days’ time (more or less Friday). I’m sorry if this is irrelevant or something but… is there any way that I can check if the bank already received the money? Also, can I have a paypal account even if I don’t have a credit card? PS: I registered my BDO remit account for the LFT. For inquiries not related to the post, you can always use the blog’s contact form. Just head over to the top right part of the site and click on “Contact“. To answer your questions, it depends on your bank. If they have a site where you can check your funds online, you can do that. Like for BPI users, they can log on to bpiexpressonline.com and check their transaction history online. This helps us determine which transaction is a remittance or not. Since you’re a BDO user, you can ask if you can register your BDO account to their website. also is that the express teller? Hi nabi and thanks for visiting the blog! Not sure what your question is, but Just visit any Bank of the Philippine Islands branch (go for BPI Express because that’s easier to access) and open an ATM account there. You won’t get charged for any money withdrawn. 🙂 Hope this helps! P500 to open an ATM account. You can contact BPI customer service for more information about it. *do u know what requirements BPI needs to have an ATM? Yup, only 500 pesos to open an account. It’s not a Mastercard/Visa credit/debit card. It’s only an ATM account. You can visit the bank or their website for the requirements. Hi. Ive opened an account through bank of commerce and linked it through local funds transfer. do you think this bank is a good choice? Hello, I would like to ask if the Bank of Commerce don’t deduct any fees from oDesk until now. im kinda confused about what particular BPI card your using.. im sorry..
can you tell me (if you don”t mind ^_^) what exaclty it is.. coz’ Im planning to open an account in BPI. Thanks! and oh! this article is soooo helpful!! actually your entire blog! i love reading all your articles..
Hi Eds! 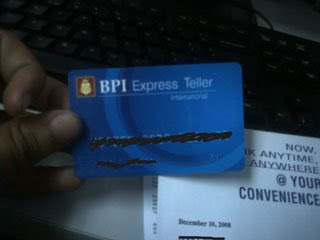 I’m using BPI Express Teller, so it’s the blue card. Hi Stef. Will it matter if I used my BPI Family savings account? This is the only one I have. I’m afraid that the Bank of the Philippine Islands and BPI Family might be two different subsidiaries. Hope you can help with this. You’ll have to use the unique BRSTN code of BPI Family Savings. From what I heard, it’s different from the BPI Express BRSTN code, which is the bank oDesk partnered with. I’m not sure what the code is though, so try contacting the bank as soon as you can so that you can use LFT for your oDesk transactions. You mentioned that in order to receive the money in full you have to apply for the BPI Express Savings. Does BPI Express Teller International work as well? I just picked up mine at the bank and I did not pay anything for it. Actually, BPI Express Teller International is BPI Express Savings. I’m not sure what you mean by “not pay anything for it” though, since you have to pay P500 to open an account. I opened the account with BPI Direct Online. When I picked it up after a week in a BPI Bank near me, I was not requested to pay 500 or 250. I don’t know why. I even asked the teller if I have to pay but she said no everything’s okay. Maybe opening an account online using BPI Direct won’t require an initial deposit. > I thought it means I can’t use my BPI express teller account to withdraw my earnings, but it actually means “do not enter the CARD NUMBER”. I should have read the instructions carefully at first. If not because of this article I could have stopped working at oDesk due to frustration. That’s great Elizabeth! I’m really glad the blog’s helped you with the withdrawal process. Now you get to work and withdraw from oDesk without a thing to worry. Best of luck to you and your freelance career! Hi Stef. I was looking for more info about oDesk’s LFT to BPI account, and found your blog very helpful. I was confused about which BPI account to open kasi, because there are certainly different types. Based on the multiple forums and blogs I have read, I think it is safest to go with BPI Express Savings, since most of the bloggers’/forum posters’ experience is with BPI Express Savings. Wala bang maintaining balance yung BPI Express Savings? Kasi I have Unionbank EON and all I have to worry about is the 350 pesos annual fee. Other than the initial deposit of 500 pesos, what else do I have to bring/present when I open a BPI Express Savings account? You have been most helpful, and may you help many more. Hi Stef! This is very informative, especially for a newbie like myself. I have just been working in oDesk for about 5 days now since I joined last July 20. I do have some considerable earnings already and a few promising contracts. The only problem I have now is how to withdraw. I have read across your informative blog and find it very useful. May I just know what is the exact name of the BPI Express Savings Acct? I checked the link you provided for Kay regarding the BPI express online and I was just wondering, because there is no exact match for the type of account name for BPI Express Savings Account. Im sorry, but I am not really familiar with BPI. I have been using LandBank ever since, but the pay for extra cost for oDesk withdrawal prompt me to choose BPI instead. I just want to make sure if your BPI account(the one you posted in the screenshot image) is the BPI Express Teller Savings or the BPI Jumpstart Savings according to the list of account types in the link you provided. I am supposing it is the Express Teller, but I just want to be sure because I will be opening an account soon. Thanks so much! More power to you..
Hello Stef! Thanks again. That was quick. Thank you so much for confirming. I’ll be opening a BPI account soon. Online Freelancing in oDesk is really wonderful, I could not make such money within the given time period. I hope to know more of you guys to build a friendly relationship so that we could continue in helping our fellow kababayans. Kudos to all hardworking pinoy freelancers! ask ko lang po BPI ang banko ko tapos kanina mag wiwithdraw na sana ako kaso yung local fund transfer hindi pa din lumalabas sa payment method i mean wala pa sya sa choices na pwede pag withdrawhan paypal plang ang nandon which is 3 days bago naging active or na activate ganon din ba tong local funds transfer mag wait pa ako ng ilang araw para ma activate? Hello, I am just wondering if that BPI Express Savings is the same as BPI Direct. I got this atm from kiosks for free. Actually, I already used it for my PayPal withdrawal and it went smooth. I’m just anxious about the “dedcution” things. Thanks. Hello, dianne. Yes, you can use BPI direct and there are no deductions. I had my EON visa electron megalink in Union bank, it is okay if I will withdraw my odesk earnings to this local transfer? My plan is to withdraw my earnings at this local fund transfer EON visa electron ATM card. Hi po ulit. Ask ko lang usually what time po kayo nag wiwithdraw ng Odesk Balance niyo? Kasi dati naman po niwiwithdraw ko siya ng after lunch tapos by Saturday meron an siya sa account ko. Ngayon nagwithdraw ako, Nov. 9. Tapos expected date of delivery niya Nov. 15 pa which is Tuesday na next week. Bakit kaya po ganun? Wala namang holiday. 🙁 Gusto ko malaman kapag ba maaga like 9AM in the morning nagwithdraw what time narereceived ung money? Your post about LFT is very informative; helped a lot of people like me. I just want to ask what is the best minimum amount to withdraw funds from oDesk? Will there be a higher charge/transaction fee for bigger amounts? Thanks! Thanks! That’s a very practical tip. Keep up the good work posting great articles. Just wanted to share. I withdraw from oDesk last Nov 16 and received a notification about the transaction and all the details like amount to reflect in PHP, which local bank it will reflect, including the date which is November 21. I checked my BPI account online several times a day yesterday and still have not received the payment. Any inputs on the delay? Hey guys! Have you tried bringing this issue to oDesk Customer Service? If I’m not mistaken it was US Veterans Day last week and another holiday coming up on Nov. 24, which could be the reason why withdrawals are taking while to be processed. oh yes Stef, I just sent a note to oDesk to inquire. I got a reply and was informed that the timeframe of LFT is between 3-5 business days, excluding holidays and weekends. customer support added I can request trace from their Finance if after the 6th day, the fund is not received. i’ll keep you informed what happened. Hi CoolJ and thanks for the comment! 🙂 I can’t provide much advice here since I’ve never used BPI Direct before (a fellow freelancer, Helene Sonza, does though. You can contact her for info about it at her website http://thearticulatepen.com/). But hey, why not give LFT a shot? We’ll then know if there are remittance fees or ATM withdrawal fees for BPI Direct accounts. i just saw this article and i have a question..
this day 12/21/2011, i accessed the LFT and said that it will be activated 3 days and that will be until 12/23/2011. now that would be friday right? i was wondering if ODesk considers saturdays and sundays a holiday. is it not? my conclusion is, if i withdraw my earnings on friday 12/23/2011 (the day the LFT will be activated) when do you guys think i’ll receive it? i am very much aware of the guides from Odesk. i asked this because i don’t want to be redirected there to read it all again since i knew it already. !!! more power to you guys !!! Regarding verification, it’s optional to have yourself verified but to use Local Funds Transfer, your bank name should be the name verified by oDesk. So in this case, you may need to push through w/ the oDesk verification process. You can ask oDesk Customer Support for suggestions on how to verify your account w/o a bank statement. i opened a BPI easy saver account (the one with no maintaining balance and only 200 for initial deposit), and i want to set it up for LFT at oDesk. however, i opened/enrolled the account at a bpi FAMILY savings bank branch, and not a bpi MAIN branch. what BRSTN code will i use then? and will i be charged of remittance fees? i hope you can answer my question. thank you in advance! Hello dex and thank you! You’ll have to check your bank account to see if your funds have already arrived. Hi! Thank you for posting this blog. I am currently new in odesk and i could use all these advices. I would like to clarify that the most important thing when you withdraw is that your account name and account number must match the name of your verified odesk account? Thank you! What should I put on the NAME? Jaymar Salvacion or Jaymar K Salvacion? Hi Stef, I have a question. Let’s say the name on my BPI account is Maria S Cruz (that’s what appears on the deposit slip). And then here on oDesk, the name that appears on the upper left part of the page is Maria Cruz (without the middle initial). To both Lai and joemar, I’m not really sure if the additional middle initial will do anything to the transaction. I’d normally give priority to the account name of my verified oDesk account, since I’ve presented documents proving my identity on the site. You can always contact oDesk Customer Support for clarification about this. Okay thanks Stef. I’ll try contacting support. Because of that tiny problem, I haven’t tried withdrawing any amount yet in fear of having complications somewhere. hello stef, i’ve chosen EASY SAVERS account for BPI because it has no maintaining balance. Is it okay? Hi Stef, I contacted support and here is their response to my inquiry. —Upon reviewing your example, the system would identify this as a “name mismatch”. ” Maria Cruz” should seek us to request it be approved if the mismatch is due middle initial or similar minor difference. The easiest way to resolve that mismatch is to match your oDesk name so that it will be identical to your bank account name. Hi Juna. I actually tried that, well not really.. I mean, I didn’t proceed. I’m not making sense, am I? hehe. On “My Account” The first and last name can be edited. I was thinking of simply adding the middle initial. So let’s say Maria S Cruz..
Then it suddenly occurred to me, should I put “S” on the first name field (Maria S) or on the last name field (S Cruz)? Either way, when combined it will still be Maria S Cruz, right? But I couldn’t decide! I know it’s funny. My BPI card bears my fullname Juna May F Yanoyan. I haven’t been having trouble with withdrawals and I’ve been using LFT for almost a year now. Maybe your middle initial won’t make much of a difference. That’s just using my own experience. Add your ATM as LFT using the name your card bears and if something is wrong I’m sure there will be a notification from oDesk. Hello, the number is at the back of your ATM card. I want to try LFT but Im afraid I’ll have a problem with this because of my name. Another thing, paypal has a low exchange rate, how about LFT? Hello, Jan. Yes, you need to have a verified oDesk account to use Local Funds Transfer. Hi, Pls help me, what BPI, BRSTN code will I use for odesk? because the manager in the branch where I created my bpi account said that all bpi branches have different BRSTN code, the main branch also has a different BRSTN code. Did you created your bpi account in the main branch or some other branches? what BRSTN are you using? Thank you in advance! Hi, Megurineluka. I use BPI Express and the main BRSTN code when registering for LFT. What BPI branch do you use? I’m confused right now. I’m new in odesk and currently I already have my earnings, I want to use LFT, can I use my eon card to withdraw my money? Someone said I need to open an account in eon-unionbank…but it says in LFT “Do not use the number on your atm,creditcard,debitcard” I got really confuse… I also have an atm account in UCPB can I use it also in LFT? pls help I really wanted to withdraw my money. Hi. I’m new in oDesk and I’ve tried UCPB account and it worked. I got my first oDesk earnings in 3-4 days. My UCPB account type is a personal account and it is a Regular Savings Account(ATM). Hello stef one more question can i use my bpi express teller to verify paypal account? Hi, this article is so nice especially to new odesk contractors. I just want to clarify the question about odesk verify. I had asked that to their customer support specialist last OCtober 2011, and she said that even if I’m not verified, i can withdraw my earnings. however, i still did the odesk verifybecause i figured that just in case there would be a problem with the wire transfer, it would be easy to fix since they can verify myidentity right away. btw, i have a question and its a little off topic, but do you have any idea if LFT had lower exchange rate than any other withdraw methods in odesk? I am from Pakistan. I am here just to express my feelings regarding odesk withdrawal. Well I am working on odesk since quite a while.For some reason LFT is getting worst for some reason it takes ages to get the money in the account. When ever I withdraw 500$ its takes 12 to 15 days to get in to my account. But when it comes to above 1000$ then I have to wait for my next birthday. What they have in response bloody ticket, and the customer service is like oki we see what we can do. There is no problem with the details and the account . I dont understand why this happens do they earn interest on holding money, really dnt know. Odesk have serious issues with there system and they a able to fix it… and wont be far when they will become history. I just made a BPI easy savers account late last month then and withdrew from odesk on June 3rd.. however another notification came on the 8th saying “Returned Withdrawal (Transaction 15862604 Reversed)”.. i don’t know how and why i got this.. can you enlighten me please? Hi, Dawn F. Have you tried contacting oDesk Customer Support for the reasons behind the return? -I’m new on odesk. Meron akong BPI Express Teller International card pwede ko bang gamitin ito sa pag widraw using LFT? Merong logo ng Cirrus, express net at itong letter “P” na pula sa back part. -Magagamit ko po ba itong BPI card ko sa paypal? Kahit wlang logo nga paypal? Or should I make new account? -Last na po to e-coconfirm ko pa ba about the taxpayer status? New on Odesk meron akong BPI Express Teller International card pwede ko bang gamitin ito sa pag widraw using LFT? Merong mga logo ng Cirrus, express net at itong letter “P” na pula sa back part. Pwede ko bang gamitin ang BPI card ko sa paypal kahit walang logo ng paypal sa likod? Or should I make new account? Hi, Glenn. You can link your Local Funds Transfer account to your BPI Express Teller savings account. Just make sure the bank account details are correct to avoid withdrawal problems. Second, you can only use a credit/debit card to verify your PayPal account, regardless kung may PayPal logo ang card o wala. hi stef! your blog is very helpful especially for me who is just a newbie to oDesk. I still dont have a bank account but im going to apply as soon as possible. i already completed my profile and was able to take and passed a number of Skill Tests. im very eager to try my luck at oDesk and hopefully I could also be successful just like the other contractors. Hope that you could help me along the way. It will be greatly appreciated. Thank you very much in advance. Thank you rowena and congratulations on starting out as a freelancer on oDesk. The Freelance Pinoy will always be here to help you build your career as a freelancer. Hello shey, so long as the ATM account is under your name and you have full control over that account, I’m sure it wouldn’t be a problem. I’m sure you will reach that point in your career as a freelancer. Keep up the great work! Thank you so much for the post, Stef. I am planning to use LFT and use a BPI bank account but I am in doubt but now it is crystal clear to me. I will open a bank account from BPI soon. Cheers! I made a withdrawal from Odesk to my EON Cyber Account UnionBank last August 08 2012, and then according to Odesk the money will be transferred by August 13, 2012, but until now wala pang natatransfer sa bank account ko, what do you think is the problem? i have set up my withdrawal methods through paypal, and LFT using my RCBC atm wise account….both po ay inactive ang status…when po ito magiging active? and ok po ba na 2 ang withdrawal method? Is BPI Direct International ATM card a valid one in LTF? It was my first time to use the LFT (local fund transfer) in odesk and wooh’ it was successfully transfer into my bank account in union bank after and it takes only 2 days for me. Stef, your articles on BPI opened my eyes and I left my BDO account and opened one with BPI Direct, the one which you can only open online and with just 500peso maintaining balance. Transfer was quick. I withdrew last Thursday and it’s on my account now. BUT BUT BUT I got charged 150pesoses. Wasn’t it supposed to free? Has anything changed? I closed my BDO account just to avoid that 200peso chop. But now 150, I’m not much better off. Is this perhaps an error on BPI’s part? Hi, Joanna. For oDesk Local Funds transfer BPI shouldn’t deduct P150 from your funds. This is probably a glitch on their part. You can forward your concerns to oDesk customer support. They will be able to communicate with the bank to clarify this. I have also used LFT to withdraw from oDesk to my Unionbank EON account. If I withdraw from oDesk on Wednesday morning, it’s credited to my EON account by Friday night. That’s one day longer than PAYPAL withdrawal which is credited to my EON account by Thursday night. Both PAYPAL and LFT are convenient withdrawal methods for oDesk freelancers. Just choose local banks that do not charge a receiving fee. I tried BDO and I was charged around 200 pesos contrary to the BDO personnel’s claim that they don’t charge any receiving fee. i was just wondering what could really be the problem.. I’m new to odesk and just to make sure that LFT works, I withdrew $15 to my BPI account.. after the clearing period, ngreflect nman sya online.. pero 150pesos was missing. eh dba dpat no remittance pg BPI ung bank mo.. bkt ganun? i hope Joanna can tell me if she was able to clarify this with odesk or bpi..
hi steff! this site is definitely a huge help for me..
i’m a housewife and in the process of looking for a job online during my free time (my husband works and no babies yet).. a friend suggested i try oDesk.. im in the process of starting and also looking for other sites offering online jobs, though most of them would send payment via Paypal/ETF. i also checked your other link (http://thefreelancepinoy.com/getting-paid/how-to-verify-your-philippine-paypal-account) and i think Paypal would not work for me.. For one thing, i don’t have either credit/debit card. I only have my BPI Express Card from my previous company. My question is: is it possible for me to use that BPI Express card which was my payroll card from previous company? Can i use that to withdraw money through ETF instead? I find ETF to be more convenient than Paypal (based on this blog). i would want everything to be ready before i start doing my jobs online. If by “EFT” you mean LFT or Local Funds transfer, yes you can definitely use your BPI Express ATM account to receive your oDesk funds. Just want to ask about this new LFT to the Philippines. I am having delay and ID issues with Unionbank, so I plan to apply for a savings account in RCBC. Do you have any knowledge about what type of card/account should be used to link to odesk using RCBC account? So long as you have the BRSTN code of RCBC and all bank details match that of your oDesk account, you can use LFT to withdraw. Though, is it okay to ask for your email address or if not, is it okay for you to e-mail me in my e-mail? Thank you for the post. It really helped me a lot. I just started working from home through Odesk and I registered my RCBC and BPI Express Teller Card. I was planning to use my RCBC card, but after I read your post and viewed the comments I decided to use my BPI instead. Since you said that it’s faster if we’re going to use a BPI savings account. Correct me if I’m wrong, I think right now it’s $0.99 per withdrawal to Philippines. Your first withdrawal in PHP is free.. Am I correct? And in regards with the currency, will it be the exchange rate that BPI provides? What I mean is If I will withdraw my money from Odesk using LFT will it be the the exchange rate of BPI and the only fee that will be deducted will be the $0.99 on my next transaction? Thanks for the comment. Yes, the fee is $0.99 per withdrawal and the exchange rate being used for LFT is that of oDesk’s. Dunno where to ask this, but can I also use this BPI savings account on elance? I never had any issues with LFT via BPI and I can say it’s the best method so far since I started working oDesk last year. But only this time that I’m kind of worried and caught my attention. I usually withdraw money from oDesk wallet every Wednesday (8am MNLA) and by Friday morning (5am earliest) it should be in the bank every time I check BPI Express Online. But just this morning (Friday- 17thMay 2013) still not there. Up until today midnight already. I process withdrawal 15th May (WED). I got the usual (2) notifications from oDesk, the Withdrawal Confirmation and the Withdrawal Confirmation. So how come it’s still not there? Who do I need to contact to verify if there is any issue needing my attention. Should it be oDesk or BPI? Ohhh how frustrating to not have the hard earned money in the weekend.. I suggest asking oDesk. I found that asking BPI is fruitless, that maybe their customer support reps aren’t aware that the bank is connected with a company like oDesk. Anyway, I would like to ask the as Nabi’s question somewhere up the thread, I think you said you weren’t sure what her question is. I think she meant to ask: Since there are options for opening an ATM acct in BPI (like BPInoy, Express Teller, Maxi Saver Savings and the like), are we free to choose from those so as to avail the non-charging of remittance? Also, would you know if the non-charging of remittance also applies to BPI Family Bank users like me? ‘Cause if not, I plan to open another BPI (not Family) acct. Yes, definitely. All of those accounts are under the same bank, so the fees (or the lack of) associated with it will be implemented for any of the accounts you decide to open. I’ve never opened and tried a BPI Family Savings bank for LFT though, so I can’t offer any advice on that. as I read on oDesk BPI Family Savings is not waived for remittance fee. Btw, stef thank you for your blog it’s really help. Hi Stef, this is a very helpful blog. I should have read your tips earlier. I withdraw(LFT) my earnings last Thursday, July 25 and already processed by Odesk, I was expecting it will be on my bank yesterday(Saturday) but I’m not so lucky because funds is not reflecting on my account at this moment. So you do to think, it is impossible that funds will be available Sunday? I usually withdraw Wednesday and got the funds early Friday or noon. My husband was able to receive his funds from oDesk today, so it should be the same case for you. What a relief about LFT! I’m waiting for my first withdrawal thru oDesk using LFT. Then I’m also planning to get BPI atm card soon. Hi, I am planning to join Odesk. I just want to know if aside from having a bank account here in the Philippines, should I also open a Paypal account? Thanks! And guys please help me, i wanna open an account to link to my LFT, im thinking of EON or BPI easy savers, but i dont get solid proofs that eon is not charging extras aside from odesk charge of $.99, but EON is better in terms of payment crediting because the pay will reflect from 24-36 hours from the date of widrawal, and BPI takes 3-4 days to credit the pay, and BPI easy savers also deducts 5peros per atm widrawal. so please please help me decide. i will be opening my account tomoro if possible thank you guys. I currently have problems in this LFT thing. There’s always Returned withdrawal transaction reversed. I dont know why thats happening. I’m new in oDesk. This blog is very helpful, thank you Stef G.! I am new in oDesk (less than a month) so I hope you could help me, too. Does anybody know if Metrobank is also a good LFT medium? I heard BPI is ok, but I only have Metrobank account. In connection, how much is the remittance fee of Metrobank and how long does it take to reflect my money from oDesk? Also, is it still advisable to wait and withdraw my money once I have already accumulated 3-4 figures in my odesk account? No limitations (like I have to withdraw it monthly)? I asked because don’t think I can achieve that kind of figure in a month. Do i need to open account in BPI Main Branch? I have bpi family bank account, does it have the same brstn code with bpi? Good day to you. I just wanna ask about the local fund transfer. Im currently working here in Macau. And I want to use my BPI account to transfer my salary from oDesk so i can receive my money in full.but as you said I need confirmation from the bank that they’ll guarantee my remittance.can you please help me how to work it out. Mylyn, I’m not sure what you mean by “confirmation from the bank.” Could you explain further or point out in the post where I mentioned this? Thanks! I would like to ask as of this month of February, did you experience any delay in LFT to your bpi account? and how many days it take to receive your money from the date of withdrawal this month? I’m planning to open a bpi account for my odesk account. I hope you can answer my question. Thanks! is there anyone based in the UK and transferred their money just to their normal account? Was it all OK??? Bit sceptical of using the transfer but I need to get the money somehow and with the lowest fee charge! Thanks!!! I just made my account today after I read your article. I opened an Easy Saver account because it’s much cheaper. I just want to ask how do I access my account info in the bpi website? I don’t have my atm yet because they told me the atm would be issued after a week. Another question: how long will odesk hold my balance? I opt to transfer my balance if it’s already $1000, and it hasn’t reached that amount yet. Wil my balance be gone after a month from odesk? i just want to inquire if oDesk LFT payment is also available for Bank of the Phil Islands – Family Bank which is a different entity…Thanks.. I am a relatively new freelancer at oDesk. My question is, can I ask oDesk to delete a negative (1 star feedback) that one of my clients gave to me?. I was engage with a very stubborn and uncooperative client. Is it really my fault if I encountered such client? oDesk doesn’t delete negative feedback by request. Doing so would defeat the whole purpose of the feedback and rating system. What you can do, if you haven’t invested a lot of time and effort on the project, is to give the client a 100% refund. Then the system would understand it as a project that never happened and won’t show on your profile. Its just unfortunate on my part, as I invested a lot of time, (I even work offline sometime), just to finish his task. All is set for me to complete , but he repeatedly refused to give some things that I need to make it possible. He is the only client of mine, that gave me such feedback.